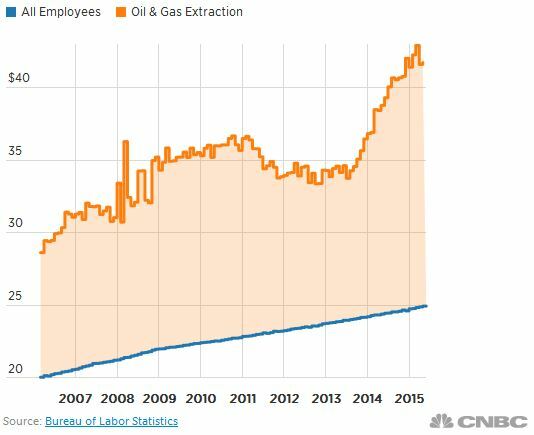 Oil and gas exploration workers just became a little more like the average U.S. worker: They too now understand what it’s like for their wage growth to lag or barely keep up with inflation. Pay packages for exploration and production workers are still big by most measures, but they are no longer booming, according to a new report. After steadily rising on the back of America’s shale oil and gas revolution, wage growth has slowed considerably in the face of a year-long commodity collapse. 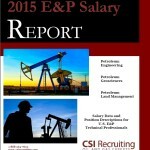 Base salaries were up 1 percent across the board for engineering, geosciences and land skill jobs, Dallas-based search and staffing agency CSI Recruiting concluded in its 2015 E&P Salary Report. Last year, base salaries rose 5 percent. And keeping pay and bonus percentages constant has been made possible only through cost-saving layoffs. U.S.-based energy firms announced 60,500 job cuts in the first six months of 2015, compared with fewer than 4,000 in the same period last year, according to job placement firm Challenger, Gray & Christmas. But CSI President Jeff Bush said employers should be credited with staving off compensation and benefit reductions. The report is based on surveys of more than 2,700 full-time, salaried professionals working in the United States for exploration and production companies. CSI found that annual cash bonuses as a percentage of base salary remained stable, but the agency warned that bonuses are the most disposable part of any compensation package. “In heady times, we hear time and again how these bonuses are ‘practically guaranteed’ and become a sticking point in negotiations as such. Today, the ‘practically’ part seems to rule the day, and not surprisingly,” the firm noted. A growing number of independent drillers are also becoming more stringent when it comes to giving employees stock, or eliminating the benefit for new hires, CSI found. The depth and length of the downturn is evident in reduced demand for even the most highly sought oil patch professionals. CSI notes that what it never thought would transpire has happened: Reservoir engineers have gone months without employment. Reservoir engineers are responsible for estimating the hydrocarbon content of an oil or gas reservoir and forecasting the future production of those assets. Those skills are just as important, if not more so, during a downturn as they are during boom times. 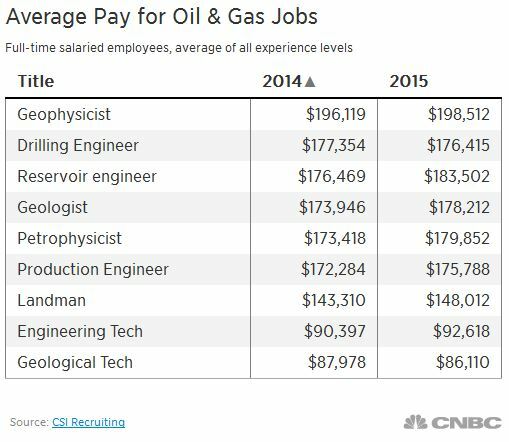 Still, the average base salary for reservoir engineers in 2015 at the mean experience level of 16 years was about $183,500. Last year average pay stood at nearly $176,500. While some engineers are feeling pinched during the downturn, they’re doing fine compared with some of the geologists, who have taken it on the chin, Bush said. Employers may have put the brakes on wage growth for now, but the cost of acquiring talent could snap back sharply when oil prices rebound, Bush said. That’s because the current downturn could force the so-called Great Crew Change—the long-anticipated departure of experienced workers who first entered the industry in the late ’70s and early ’80s is cause for concern, because the industry has too few mid-level workers. That’s because of a dropoff in hiring and cratering petroleum engineering enrollment that took place during the 1980s oil bust. Now, many of the industry’s most experienced workers are retiring or taking buyouts. With several years of additional pay in the bank after the 2008 downturn, and their stock portfolios made whole thanks to a six-year bull market, those veterans are confident enough to punch out for good, Bush said. At the same time, both exploration and production companies and oilfield services companies have curtailed entry-level hiring.